Campbell, P.i. and I.a. Reid. "Waterfall". The Canadian Encyclopedia, 25 January 2018, Historica Canada. https://www.thecanadianencyclopedia.ca/en/article/waterfall. Accessed 24 April 2019. A waterfall is a phenomenon which occurs when water flowing in a river channel encounters a vertical or near-vertical drop in the channel bed. Wilberforce Falls, Hood River, NWT (photo by Richard Harrington). More than nine million people annually visit the seven preserves along the Alberta-British Columbia border (photo by Wayne Lynch). Helmcken Falls, BC, on the Murtle River, have carved an impressive cauldron out of the layers of lava (photo by J. Kraulis). Virginia Falls (Environment Canada/Prairie Region). A waterfall is a phenomenon which occurs when water flowing in a river channel encounters a vertical or near-vertical drop in the channel bed. A cascade occurs when the drop results in a series of small falls; rapids occur where the river is steep and turbulent and the water remains in contact with the bed; and a cataract when a waterfall has a large volume of flow. Waterfalls can be classified according to nature of origin. Geological discordance falls result from a natural discordance in the river profile caused by geological faulting, glaciation, uplift plateaus, springs emanating from canyon walls or earthquakes. Twin Falls near Yoho Glacier, BC, and Niagara Falls, Ont, are examples. Cap-rock falls and vertical barrier falls are typical erosion waterfalls, formed by differential erosion that occurs where erosion-resistant rocks are underlain by or adjoin softer rocks. A cap-rock fall is formed when a surface layer of hard rock rests on a softer layer. Water flowing over the hard rock cap erodes the face of the softer rock underneath, undermining the cap, which eventually breaks and tumbles into the river at the foot of the fall or immediately downstream. Over time, a fall of this kind may degenerate to a long cascade. 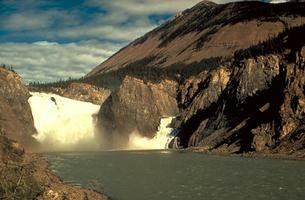 Alexandra Falls on the Hay River in the NWT is a cap-rock fall. When a layer of very hard igneous rock, extending vertically through great thicknesses of softer rock, lies across a river channel, the erosive force of flowing water will not significantly affect the igneous rock but will wear down the softer rock, especially in the area immediately downstream from the igneous rock. A vertical barrier fall is eventually formed at the face of the vertical layer of hard rock. Little Falls on the Pigeon River south of Thunder Bay, Ont, is an example. Tidal falls are typified by the reversing falls originating from the ebb and flow of ocean tides. A rock shelf across a narrow point where a river empties into the ocean forms a waterfall at low tide because the water level in the river above the shelf is then higher than sea level. When sea level rises with the incoming tide to the point where it is higher than the river level upstream from the rock shelf, the seawater forces its way upstream against the flow of the river and through the narrow point in the channel. The resulting rapids, whirlpools and eddies create the impression that the falls have actually reversed. A notable example occurs on the Saint John River at Saint John, NB, where the very high tides of the Bay of Fundy create the reversing effect. Other reversing falls in Canada are at Wager Bay, Ford Lake, and Barrier Inlet, Hudson Strait, both located in the Northwest Territories. Geologically speaking, all waterfalls are transient because their erosive power makes them self-destructive. This erosion is noticeable within a human lifetime at certain falls; eg, Horseshoe Falls on the Canadian side of the Niagara River. The crest of this waterfall has retreated approximately 335 m (roughly one metre per year) since its position was first recorded by Louis Hennepin in 1678. Since its beginning with the retreat of the last ice sheet about 10 000 years ago, the Niagara River has eroded a stretch of channel approximately 12 km long, creating the spectacular Niagara gorge. Along the bed of the Niagara River, downstream from the falls, there is evidence of plunge pools, cut during periods when the position of the crest was stable. When a waterfall undercuts itself and large blocks of rock drop from the scarp (face), the material tends to accumulate at the foot, gradually turning the falls into rapids. The American Falls on the Niagara River are a good example of this process; the relatively rapid erosion is caused largely by the effects of large volumes of water falling from a high plateau. By contrast, there are some very high falls where erosion is much slower because water flow is small and the water is dispersed to a fine mist during its descent. The oldest falls, thought to be many millions of years old, result from water descending from high plateaus. The world's highest waterfall (with a single, vertical drop of 807 m), Angel Falls, Venezuela, is an example. There are various interpretations of what constitutes the height of a waterfall. Most waterfalls start with a series of rapids; the water then goes over the crest and drops vertically or nearly vertically, ending up as a cascade tumbling over accumulated debris. The heights shown in the table refer to the vertical or near-vertical drop from the crest to the top of the debris. The highest waterfall in Canada and 16th-highest in the world is Della Falls (dropping 440 m), which falls from Della Lake in BC. Waterways were the highways of Canada's early explorers; waterfalls were obstacles to transportation along these routes and had to be bypassed, usually by overland portages. Town sites were often established near a large falls on a navigable river and they marked the terminus of a portage. 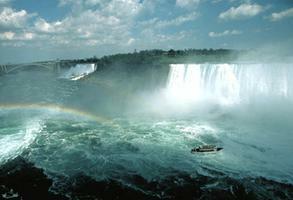 Later, canals were constructed; eg, the Welland Canal bypassing Niagara Falls. Waterfalls serve as natural barriers that prevent undesirable aquatic life from migrating to upper portions of a watershed. For example, before construction of the Welland Canal, lampreys were unable to move upstream from Lake Ontario. Waterfalls also mark the sites of hydroelectric power concentrations; in Canada many have been developed for this purpose. Many Canadian and foreign visitors view these spectacular natural attractions, drawn by the awesome power of falling water and the majestic settings. WaterfallsSearch the Atlas of Canada for maps and related data about waterfalls.